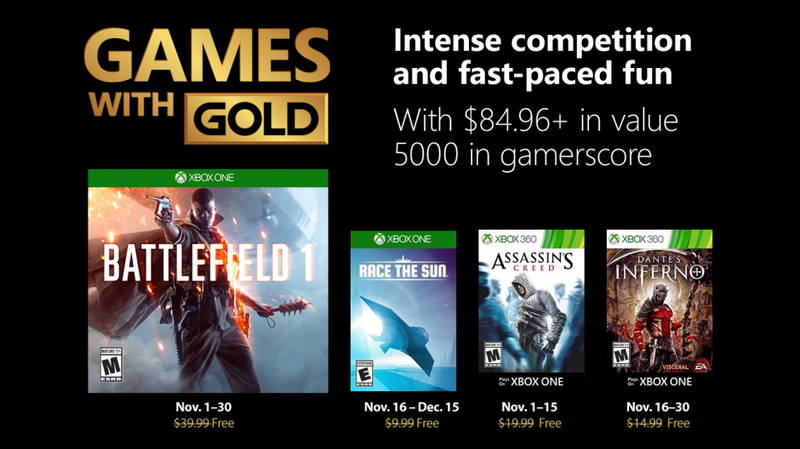 Are the free Xbox Games With Gold titles for November 2018 any good? Christmas has always been thought of as a time for giving, but even though the holiday celebrations are just around the corner, it’s not quite time for us to be expecting great gifts. But as November 2018 rolls around, that is exactly what the team at Xbox HQ are giving us with the free Xbox One and Xbox 360 Games With Gold titles. But are they actually any good? Will you want to play them? By golly, yes! In fact, for many it’ll quite possibly be the best month for some time as we get the chance to take in some proper blockbusters, and a rather lovely little indie title for absolutely no cost. It’s the biggest freebie of the month, but it shouldn’t really come as too much of a surprise to see Battlefield 1 being stripped of its price tag, what with us having the launch of Battlefield V just a few days away. You shouldn’t be looking at the numerical differences between BF1 and BFV and thinking you’ve missed out on a ton in between though, as this isn’t a title that has been around very long at all. In fact, it’s been here just two years and is still one of the hottest properties in the shooting genre. Given the opportunity to head in to the dawn of all-out warfare, Battlefield 1 is an absolute stunner. It gives us the chance to lead out the infantry, it allows the opportunity to hunker down in some super powerful tanks, and it lets us turn the tide of the battle by making best use of a number of Behemoths – proper battle changers. With stunning visuals and audio, both an impressive story and a hugely immersive online offering, Battlefield 1 may soon be usurped by it’s fancier brother, but just seeing it arrive for nothing via the Games With Gold scheme will no doubt be enough for many. At first glance you may be left thinking that Race The Sun is the filler of the month, put in place to ease the gap between the bigger, more well established names. You’d be wrong to ignore it. An endless runner that flows at warp speed, your task in Race the Sun is to do just that – race the sun. For when the big bright yellow thing in the sky sets, your solar powered craft will grind to a halt and you’ll be left floundering. In order to keep moving you’ll need to swiftly navigate your way past multiple obstacles, dipping left and right and hoping you don’t clip them. For you see, knock even the smallest rock or largest structure and you’ll find your time ticking away and chances of success diminishing. When you get into the flow of things though, you’ll find that Race the Sun is a hugely addictive draw, one that sees the introduction of challenges giving you something else to worry about too. Many may find that the swift nature of Race the Sun is a glorious way of enjoying the endless runner, whilst others will hate upon it from their very first death. But give it a go, become at one with the stunning mechanics and get drawn in by the super simple, super sharp visuals and you’ll begin to realise that racing the sun is a hugely enjoyable task in itself. Assassin’s Creed – 1st-15th November – Consider it! Ah, the original Assassin’s Creed – the game that kicked off the huge success of Ubisoft’s ongoing franchise. If truth be told, the very first game in AC lore, this one, isn’t the best. In fact, it’s quite possibly the worst – or at least the most repetitive. But in the same breath we can go on about how it placed the founding bricks for all the games to come after it, shaping the tales that immersed us throughout. To kick things off though we get taken back to 1191AD and dropped into the shoes of Altair. Now, moving in and out of the present time was very much a big deal for Assassin’s Creed back then, and for all the stabby stabby action, there was nearly as much slow paced laboratory wandering as Desmond Miles, and whilst that was the best way to set the scene, it wasn’t the most appealing. Storytellers will be in their element, but for those who just want to head on out into a huge adventure full of fascination, wonder and a ton of different events (much like you get the chance to do in the likes of Assassin’s Creed Origins and Assassin’s Creed Odyssey), then you may well be left wanting. You do however need to bear in mind that the original Assassin’s Creed is now more than a decade old, and it’ll probably show – especially if you’re coming direct from the more recent games. Dante’s Inferno – 16th-30th November – Consider It! If you’re looking for some decent combat, some platforming elements and a puzzle or two to test the brain, then Dante is your man. Dante’s Inferno sees you trying to free his love, Beatrice, from the grip of one Lucifer. As you may expect, this will take you down into the darkest depths of hell, a place frequented by all manner of monster. The problem is, in order to complete the epic quest that Dante’s Inferno brings, you’ll need to go head-to-head with them. Hell isn’t the greatest of places though and this isn’t the greatest of games either. In fact, even though it was well received upon initial release back in 2010, if you were to have to pay full price for Dante’s Inferno right now, then you’d no doubt be left disappointed. For free though you can expect a fairly decent time – at least until the next batch of freebies comes along. So there we have it – another month of free Xbox 360 and Xbox One games on the horizon and what a month it looks to be ahead. Whilst yet again the native Xbox One games are the standouts, you may as well give the 360 titles a little look, if only as something that will push you through the quieter Xmas period. If you are unable to open the wallet enough to warrant a purchase of the multitude of big names games that are releasing at this time of year, then these freebies will most definitely suffice. Let us know what you think of the free Xbox Games With Gold titles for November 2018 in the comments below.